On another note, I just found out that I haven’t yet introduced my new neon babies to you… Please welcome The Cambridge Satchel Company bag and Yochi necklace! Neon is not only super duper trendy and extremely fun to wear but also versatile and can complement lots of different colors. Have you bought anything in neon color yet? How do you wear it? love these shoes and the combination with the trousers...simply perfect. I never thought about having neon shoe laces or any color for that matter to make an outfit pop!! Thank you for the idea. I'm having a you choose cashmere giveaway on my blog, I know you'll love it please pass by and enter! love how you added the pop of neon! and neon is growing into me.. Your hair is oh-so beautiful...and I'm loving the way your monochrome outfit makes the neon just pop! 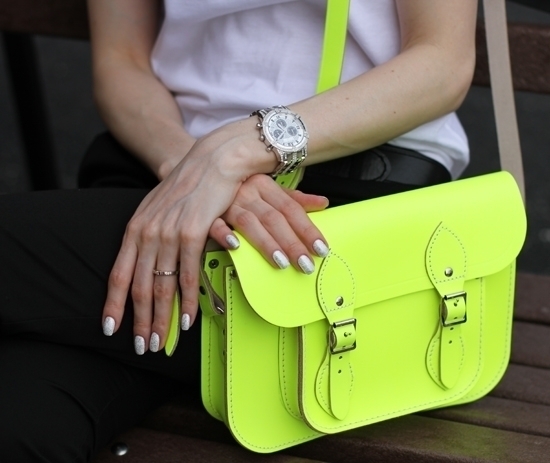 Wow neon is a stunning colour for cool outfits! Omg, I love those shoes, they're perfect! The neon accents in your outfit are pretty awesome too, and I'm pining for your watch, just so ya know ;) Thank you so much for visiting my blog, it really means so much to me! I'm looking for followers, I always follow back..
WOW honey this is so inspiring!Love how you styled everything,neon details are so eye catching! Your outfits are absolutely gorgeous! You got such a great style! Love the shoes! The idea of using shoe laces as an accessory is brilliant! Following you now! Follow back? Great outfit, I love how you have used the neon to give a splash of colour on your look. oh wow that bag and those shoes are perfection! i lvoe that u combined them with basic black and white... definitely made the statement! i follow ur blog thru GFC cos ur style is cool! hope u cud visit mine if u have time. Do you want to followe each other? Im w8ing you in my blog! Those laces are too cool..love 'em!